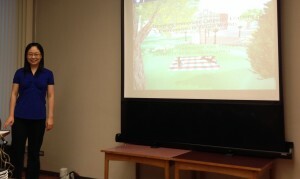 Congratulations Yifei Wang, who successfully defended her PhD dissertation, “Designing Immersive Language Learning Environments in Virtual Worlds.” Yifei’s defence on 11 December was textbook perfect, in both presentation and response to questions from the Examination Committee and External Examiner. 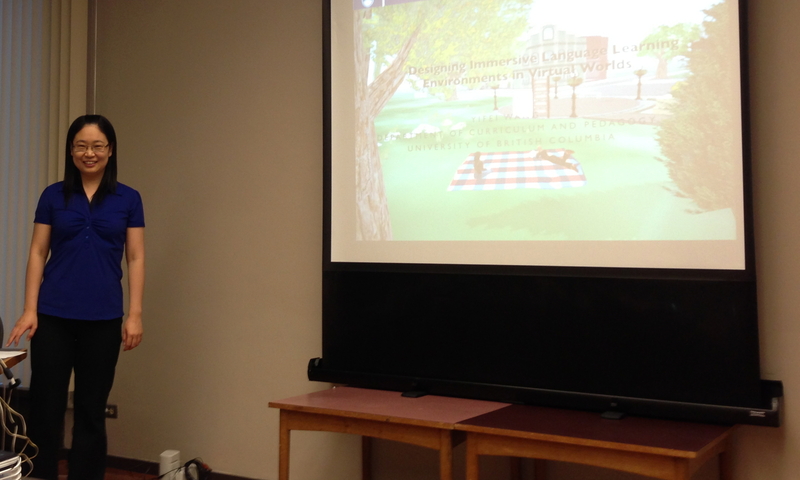 Minor revisions were completed and submitted, and Yifei is now Dr. Wang! The dissertation research involves a sophisticated design and analysis of an immersive learning environment. During the past decade, there has been increasing attention to second/foreign language teaching and learning in virtual worlds. The purpose of this study was to explore affordances of a 3D virtual world platform designed as an immersive language teaching and learning environment. Focusing on designing virtual worlds as a catalyst for change, three design phases (development of artifact, low fidelity prototyping, and high fidelity prototyping) were detailed and documented in this study. Nineteen students from a pre-service teacher cohort, two technicians and eight language learners from high schools in Vancouver as well as eighty language learners from universities in China were involved in this study; participants were asked to immerse themselves in the virtual language learning environment designed for the study. Participants’ interactions in the virtual world were videotaped and avatar interactions were recorded. Group discussions, observations, suvey questionnaires and the video-stimulated post interaction interviews provided complementary data for understanding affordances of virtual worlds in designing immersive second/foreign language learning curriculum. Analysis of the feasibility study, low fidelity design, and high fidelity design suggested a more robust design for immerisve virtual language learning environments. Three design cycles revealed primary design factors of immersive second/foreign language learning in virtual worlds (embodied avatar, co-presence, and simulation) and their relative significance in the process of learners’ meaning-making and knowledge construction. Findings showed that embodiment through an embodied avatar, community of practice through co-presence, and situated learning through simulation had a greater impact on the immersive virtual learning design. Building on a theoretical framework of embodied mind, situated learning and distributed cognition, this study documented features of learning theories key to language learning curriculum design in virtual worlds. The findings and techniques resulting from this study will help designers and researchers improve second/foreign language curriculum design in virtual worlds. It also prompts designers and researchers to achieve a better understanding of how virtual worlds can be redesigned by rethinking learning theories. The refinement of design-based research stages into low and high fidelity prototyping provides researchers with empirically tested and nuanced understandings of the design process. This entry was posted in Alumni, HWL Team, Knowledge Generation, Technology Studies and tagged HWL Team, knowledge generation, Media Studies, Technology Studies. Bookmark the permalink.